This Bat Motel is a fun one to color. I colored this one with copics and spica glitter pens; black so it looked spookier with the yellow glow from the windows! I cut it out and mounted it on some dark blue glitter cardstock. 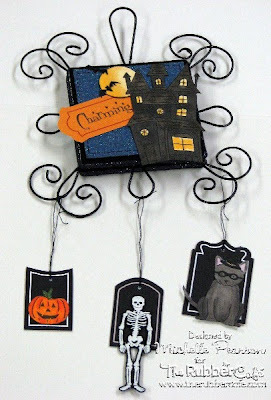 The tags are actually tombsones cut from American Craft's Halloween Collection; Undead. I decided they looked like tags, so used them to frame my other images. Charming and the kitty come from the Charming Kitty set. The jack-o-lantern comes from the Trick-or-Treat set. The skeleton is called You Shake My Bones. This is actually a christmas ornament I picked up at Michael's and sprayed black. I glittered the edges in black and tied the tags on with embroidery floss. I left tails....to look more spider webby!